We proudly carry Lady WahMaker clothing. 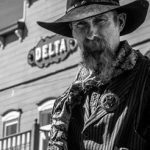 Living history, civil war and old west reenactors have long known that WahMaker stands for authentic styling and unequaled dependability. If you want a Lady WahMaker item that you don't see in our Ladies Old West Store, please contact us for a WahMaker special order! Browse all Lady WahMaker items. Click here to visit our Men's Wahmaker Department.